Are you interested in sponsoring Franish? You can find out more here! Target Floral Ankle Pants (seen here) originally $30, on clearance for $13: As I mentioned on Tuesday, I saw these pants on AJ and felt the urge to make them mine immediately. I was even willing to pay full price for them because I really like the shape and print, but I got lucky by finding them on the clearance rack! The fabric and cut will be perfect for this spring. 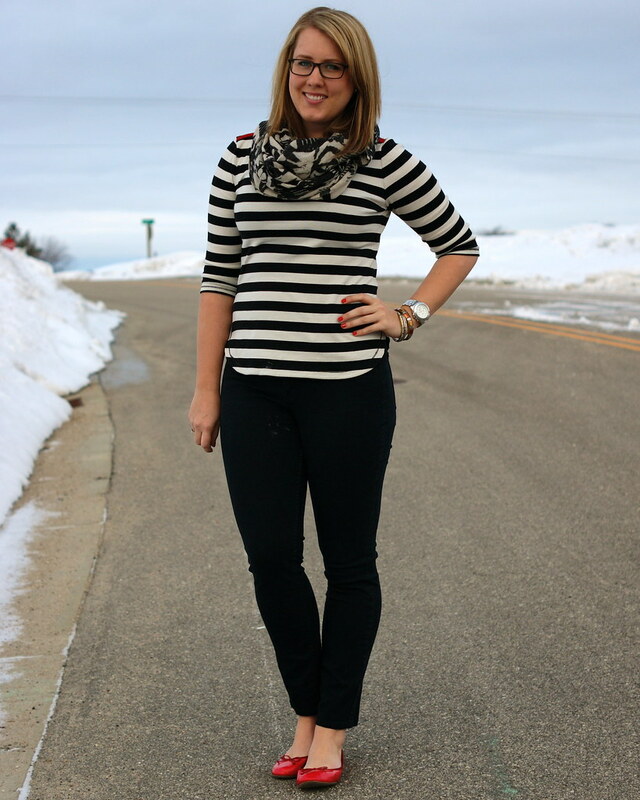 Gap Boatneck Tee (seen here) originally $25, on sale for $14: Although I love striped shirts, I don't really have many in my closet. While this isn't on my "holes in my closet" definition of striped shirts I want, I really like it (even if it reminds me of the Hamburglar sometimes haha). Target Scarf (seen here) $13: I mentioned here that I was looking for a bright floral scarf this month, and although I wasn't able to find this at any of my local Targets, Audrey found it at hers and became my personal shopper by picking it up for me and sending it my way. 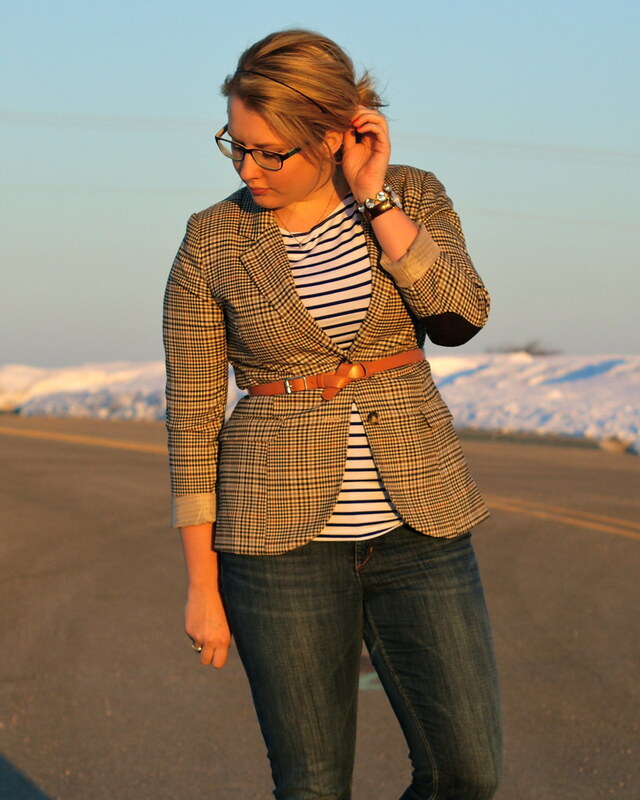 See how she wore hers here (obviously I will be recreating this outfit ASAP). I think the colors make it pretty versatile for both this early spring, and actually any time of the year. Target Cardigan, thrifted for $4: I mentioned in my med school wardrobe dress code post that I would like a few solid colored cardigans. This one looked brand new, and the color seems pretty versatile. Kenneth Cole dress, thrifted for $7: a fun black/white printed wrap dress for $7? Sold. 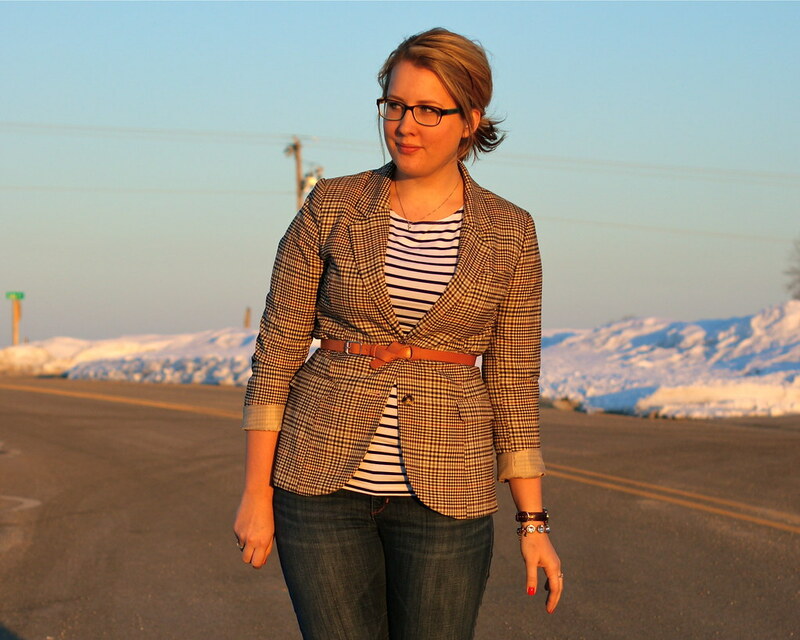 J.Crew Cardigan, thrifted for $4: I left my favorite grey cardigan in the back of someone's car and never got it back (it might actually be the oldest piece of clothing I owned...if I still owned it). This cardigan is a bit thicker, but so soft. It's missing a button at the bottom but that's nothing a trip to the fabric store can't fix. Coach Willis purse (seen here) via Etsy for $50: My favorite purchase of the month! After the little bit of restoring, she looks pretty much brand new. It's the purse I now grab every time I don't need to lug my work tote around with me, and I'm truly excited every time. J.Crew Factory Chambray Popover (seen here) originally $70, on sale for $30: After several different options were tried on, I'm happy I choose this version. I've already worn it a few times since I received it last week so I'm feeling confident about this purchase. 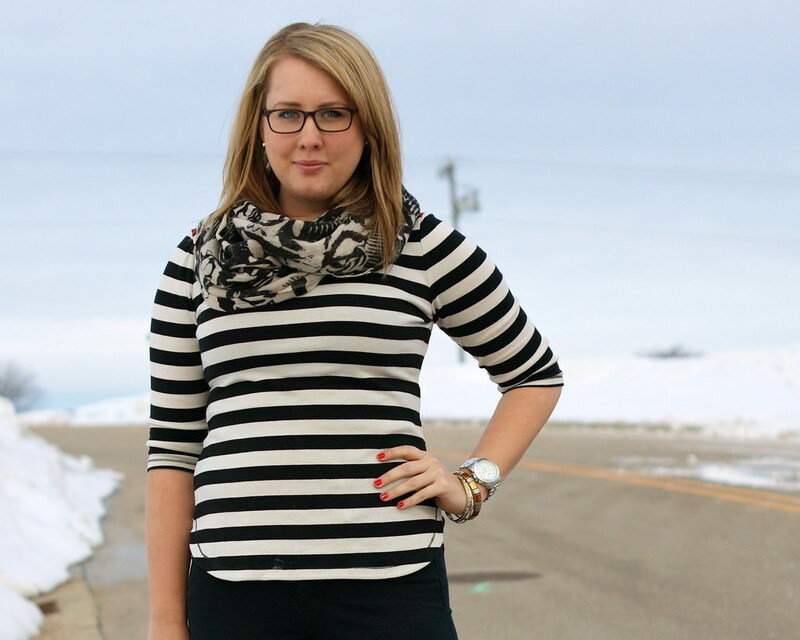 Gap Pure Cowlneck Sweater (seen here) on sale for $20: This wasn't a planned purchase or something I was looking for at all. I probably won't get much more wear out of it this season but I'm sure with its neutral color and thick comfy fabric that it'll be in heavy rotation next fall/winter. The Limited Ankle Pant (seen here) on sale for $20: While I'm not 100% sure if these will be on the "not allowed" list for school, I think I'll still get plenty of wear out of them at work. Once it gets in the 80s+ here, it gets really tiresome putting jeans on and driving around in the humidity with denim clinging to you. Tahari Striped Tee via TJMaxx (seen here) for $20: I went to visit Chris at his away rotation site last weekend and that boy loves a deal more than I do so we spent some time at the local Goodwills and TJ Maxx. He found a sweatshirt, I found this soft striped tee. Galisfly above the knuckel rings (seen here) for $16: Even though I purchased these with paypal credit I'm including it in my budget post because...it's still money spent. I wear these rings quite a bit - they're small enough to not be obnoxious but make enough of a statement. Gap Cat Blouse (seen here) originally $55, on sale for $33: This may be a shirt where in 2 years I ask myself why I bought this, but ya know, I really like it right now. The quirky print on a classic style of shirt means I can probably get away with a lot more than if it was a more casual style shirt. Plus I think it's just really dang cute. So there. Cold Water Creek Cardigan (seen here) thrifted for $4: I wasn't really sure about getting this cardigan as I wasn't sure of a lot of ways of wearing it, but now that I have it I'm excited to mix it up a bit. Maybe a thin striped tee? but definitely with a dress of some sort. and a skirt! So there's 3 possible outfits already, bringing the cost/wear down to $1 in just 4 wears. Ok so "technically" I'm under budget this month. I sold 3 jackets and a sweater on eBay this month, and as a part of my budget terms I allow that money to go back towards my clothing allowance. All three jackets were from my college days and hadn't been used in years so I didn't feel like I was really missing anything by selling them. I felt I made pretty good choices this month - nothing really too trendy besides maybe (ok definitely) the cat blouse, the floral pants, and the rings, but even then I know I'll wear those pieces a lot. I really tried to take my time with finding the right chambray popover for me, and I found the purse on Etsy and then did a bit fixing on my own, so I feel really content with those purchases. I did do a bit more shopping than I intended to this month. Chris was gone on his rotation for the whole month, and with the colder weather, I was pretty bored. Shopping shouldn't be a time filler, but what can I say, I was vulnerable! With the now warmer weather and longer days I'm able to spend more time outside. I'm also borrowing my mom's sewing machine for a few weeks so I hope to alter a few pieces and possibly even make a piece or two! + Find the perfect white (and possibly black) t-shirt. I only own one plain white tee, and I kind of hate it. It's really clingy and I avoid wearing it. I want a few tees I can just throw on and feel comfortable in. I want a full short sleeve (no little slanted sleeves for these arms please), v-neck, not completely see through, and not clingy. 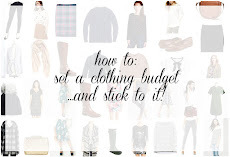 I'm going to look at all price options - from Target to Old Navy to Gap to J.Crew to Everlane. I'll of course blog about it because it didn't happen if I don't tell you about it, right? 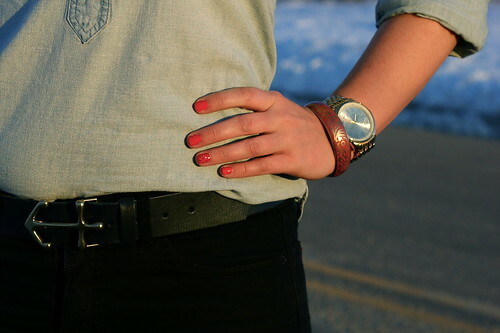 + A thick dark brown belt like this one or this "perfect belt". I've wanted a sleek thicker brown belt for a while now. I look at the thrift stores every time I go because they always have a lot of belts, but most are cheapo ones, or they are in size small and these hips do not do a small. I'll of course continue to look at Goodwill / Savers / St.Vincents but I'll also start looking at stores. 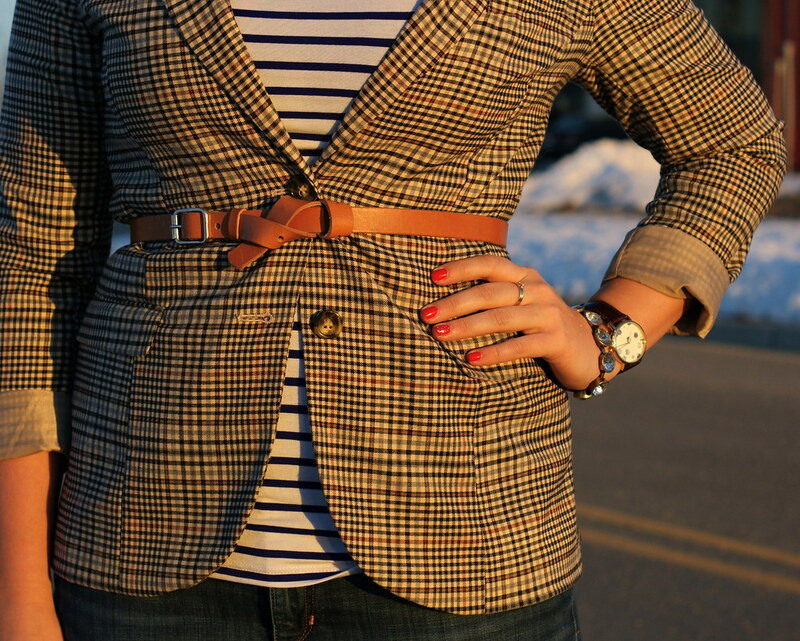 Do you have a favorite store for belts? + I'll still be searching eBay / Poshmark for another pair of Joe's Jeans. Mine are really starting to wear in the thighs - enough that I'm scared every time I crouch down that I'll tear them. + Pointy toed flats, possibly with a bow such as this pair or this pair. I always love them on others but am not sure if I would like them on myself. I want to at least try a few pairs on to see how I feel about it. How did you do this month? I would love for you to join budgetting bloggers! Just link to your budget post below. Please link back to this post so that your readers can discover other bloggers who at least try to stick to their budgets! 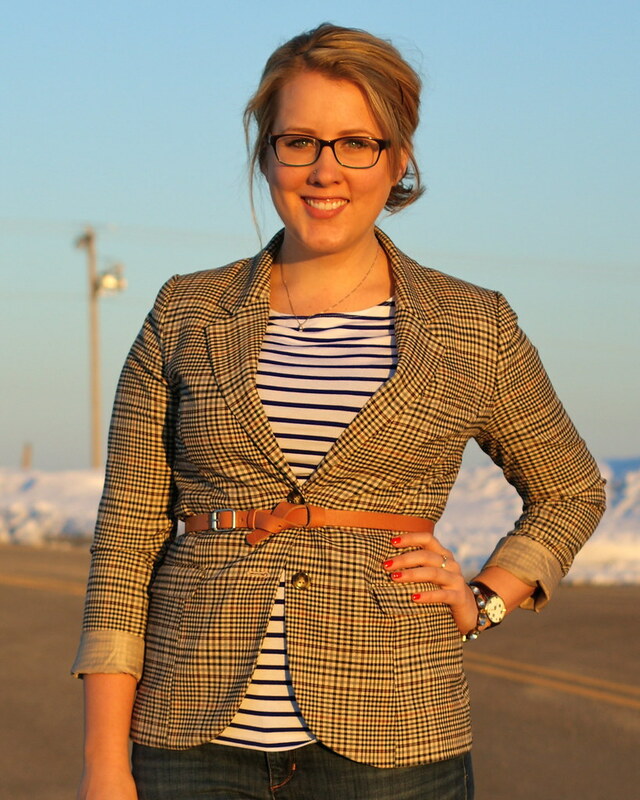 Linking up with Thrifters Anon. 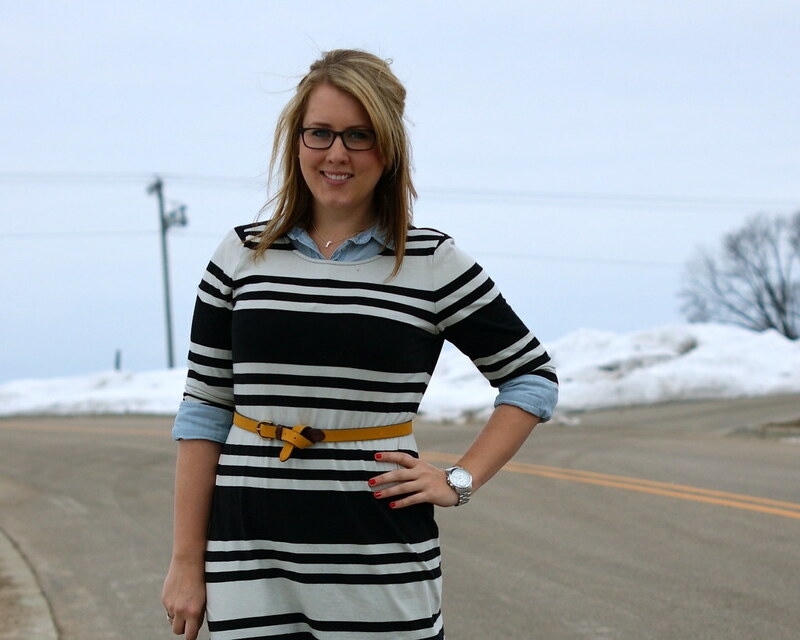 This week's Behind the Blog features Lauren from Fizz and Frosting. 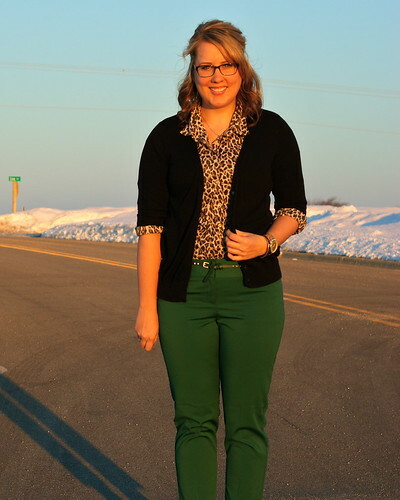 Lauren has a style that I find really aspirational but attainable - she's just so darn cute and always pulled together. Plus her legs were made for skirts and heels - look how long they are! I don't really own a lot of dresses that I really like. In fact, I'm taking a bunch to be consigned soon because I feel guilty about them hanging in my closet. 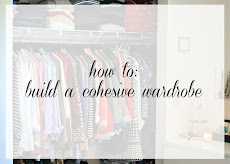 I've actively been working on getting rid of any clothes I don't wear in my closet, but what tricks me is the other closet that we don't use that holds all of my dresses. Every single dress since my senior year of high school hangs in there, and I don't wear a single one. Most don't fit correctly (please, like you fit into the clothes from when you were 17), are too short for a 25 year old lady to wear, or just have no place in my life. Anything that hasn't been worn in 2+ years is getting consigned in the coming weeks. But not this dress. This dress is like wearing pajamas but without having to be embarrassed about wearing them in public. She's soft, surprisingly flattering for a striped tee shirt material, and best of all, didn't cost me more than $20. The cost per wear is lower on this dress than I think any dress I've owned before, and I've only worn it 4 times (twice not blogged - I know, I'm shocked too). I wish Fran from 3 years ago would have made smarter shopping decisions. I kind of stumbled upon this groundbreaking outfit while I was trying to figure out what accessory to wear for 5D5W, but also for Bloggers Do It Better. My boatneck tee is so soft, so it was perfect for a more casual day. Mixed with my favorite scarf, it's a little bit of pattern mixing, a little bit of Little French Girl, and a little bit of Hamburglar. 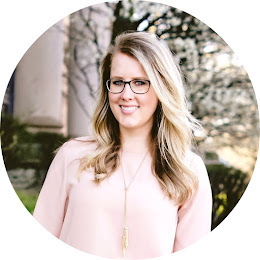 Linking up with Whitney for our 5 Day 5 Way Challenge, for Kristina's Bloggers Do It Better Challenge, and WIWW. 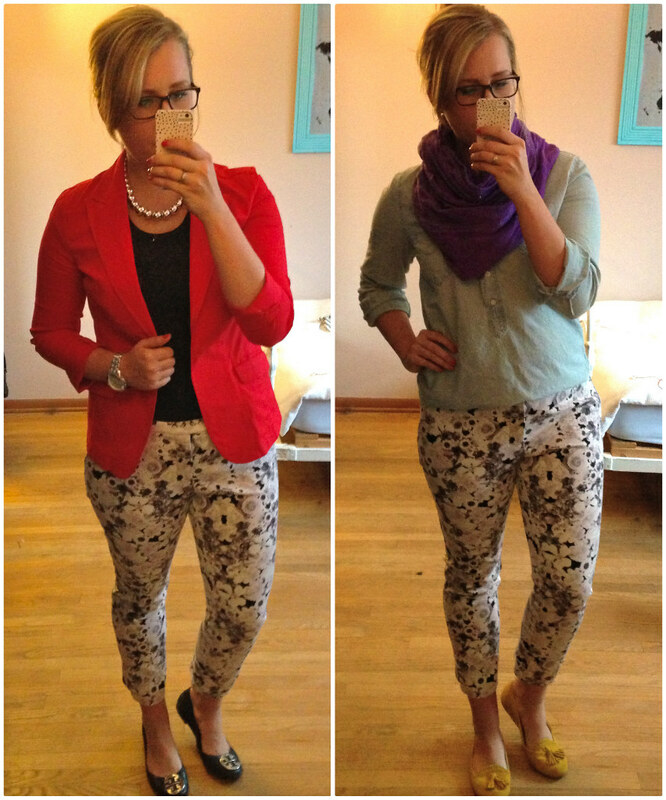 For today's 5 Days, 5 Ways challenge we have pants (or if you want, skirts!). I obviously do not struggle with wearing pants since it is what I wear ~95% of the time (but not always by choice). 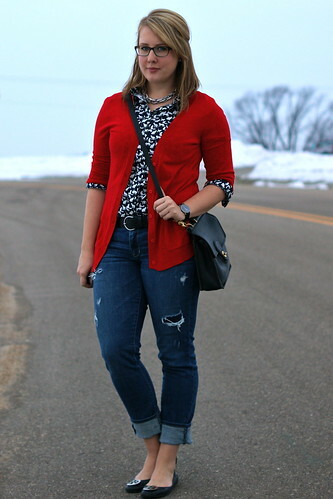 I originally was going to show ways I've worn my favorite pair of jeans, but after Kimmie pointed out that wearing a black cardigan is just about the easiest thing out there to do (so true) yesterday, I felt I needed to step up my game for this blogging challenge. 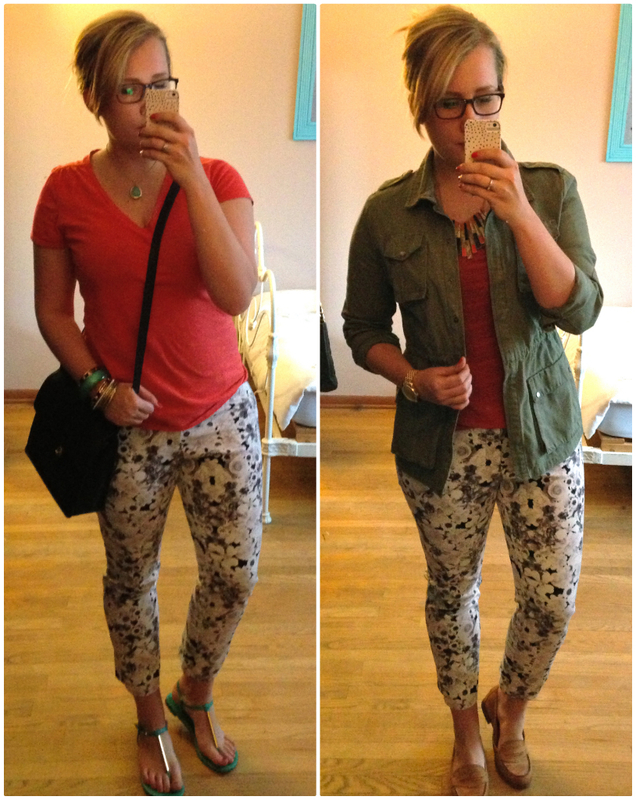 A few weeks ago AJ posted the cutest outfit - I needed those pants in my closet immediately. I have always wanted to wear floral pants, but almost all of them out there are printed denim, and as I've learned the hard way, I just don't like printed/colored denim on myself. But these were dress pants - much more flattering for my thighs. I went to Target in hopes that I could find a pair for myself - and I did find them on the mythical clearance rack that everyone always has so much luck at, but I never find anything on. Except these pants. I found these pants for $12 and change. TARGET DOES IT AGAIN. But because they require a little bit of alterations at the waist, I haven't worn them yet in the "real" world. Instead I played dress up in my bedroom. 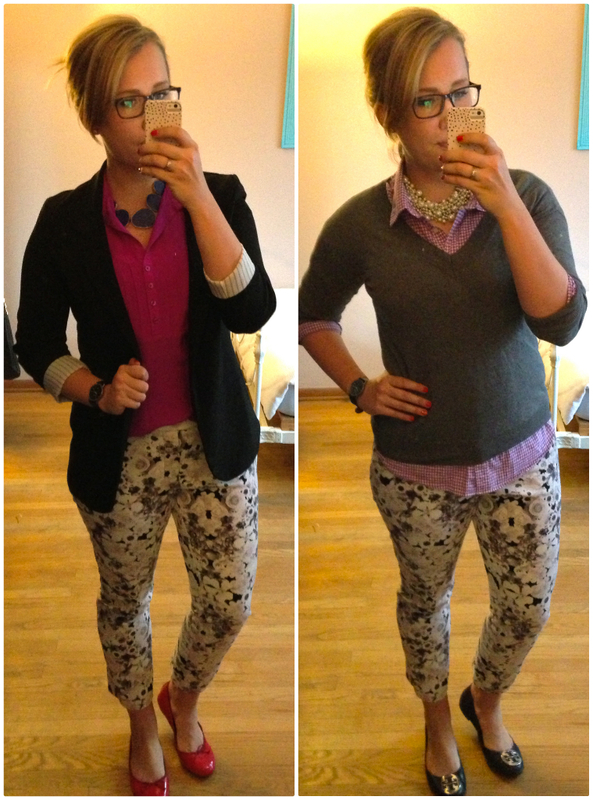 I came up with the following six (overachiever status) outfits. Which one is your favorite? 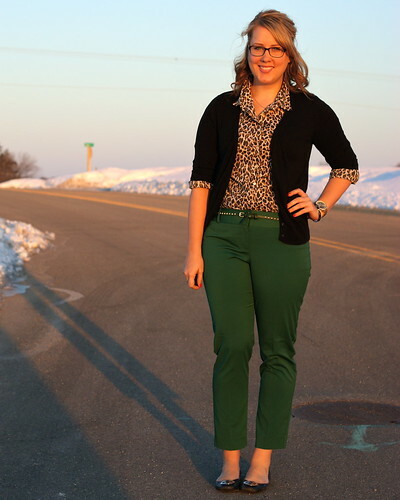 Looking to add neutral colored floral pants to your closet? 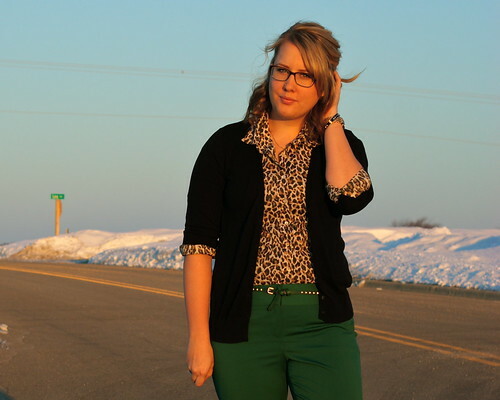 Try this Tilly pair for $14, this pair F21 pair for $23, or this Ann Taylor pair for $60! Your turn! How have you worn different bottoms? Please link up below. 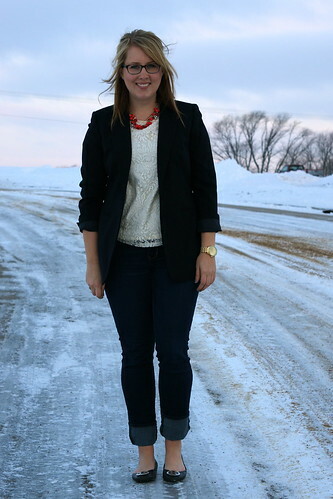 Tomorrow's challenge is accessories - the link up will be on Whitney's blog! 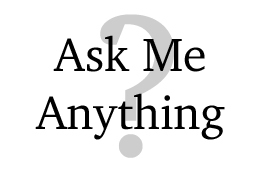 I'll give you one guess what my accessory will be. As I mentioned Monday, I purchased a Coach Willis purse off of Etsy after being inspired by Extra Petite's post on purchasing current Legacy collection styles as the originals off of the used purse market. Buying a used purse comes with the expectation that it is going to have a bit of wear to it, and this purse was no exception. I did a bit of leather restoring research before purchasing it to see how easy it would be to touch up the worn parts. 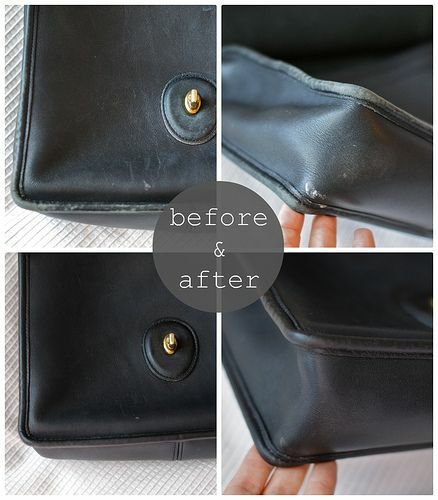 From what I read, all you have to do is use a leather pen and easy peasy, new purse! What, you expected that I wasn't going to wear my new shirt right away? We all know better. 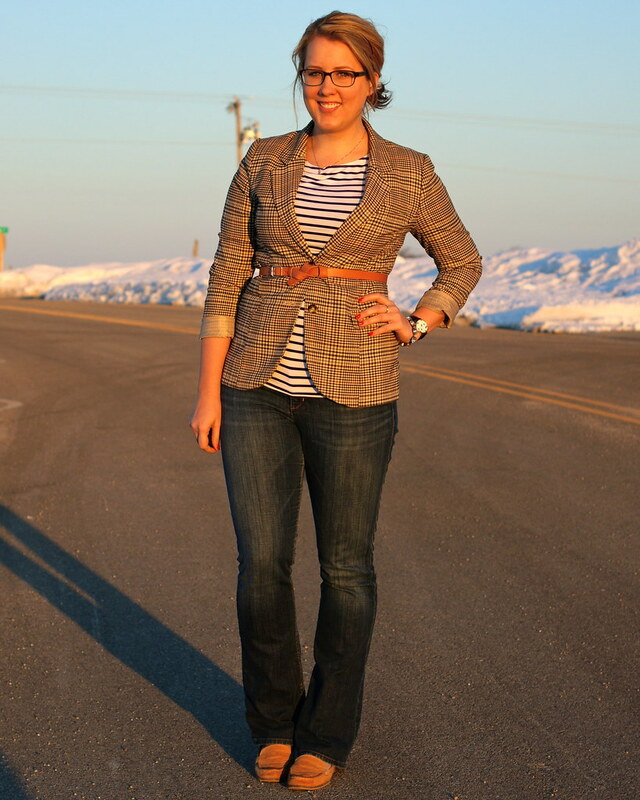 While it was only 6 degrees on the first official day of spring, I felt it would only be appropriate to wear my new floral scarf that Audrey tracked down for me (what a gem that girl is), and my favorite belt. 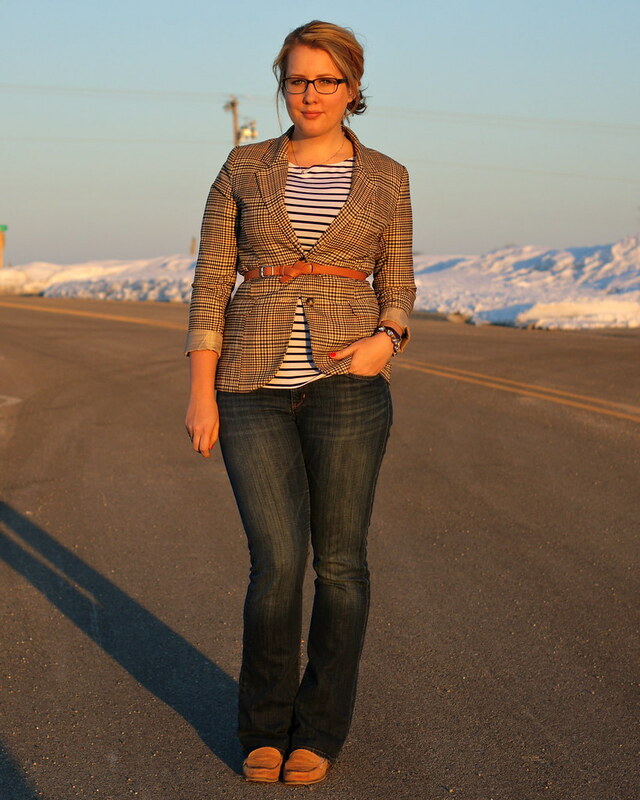 I got this Madewell belt last summer on clearance (worn here), but it looks like they brought it back again this year - smart move, Madewell. Don't forget! 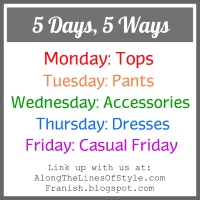 Monday starts the 5 Days, 5 Ways link up - first up is tops! I can't wait to see all the ways you've worn a shirt / jacket / vest / something that covers the top part of your body. 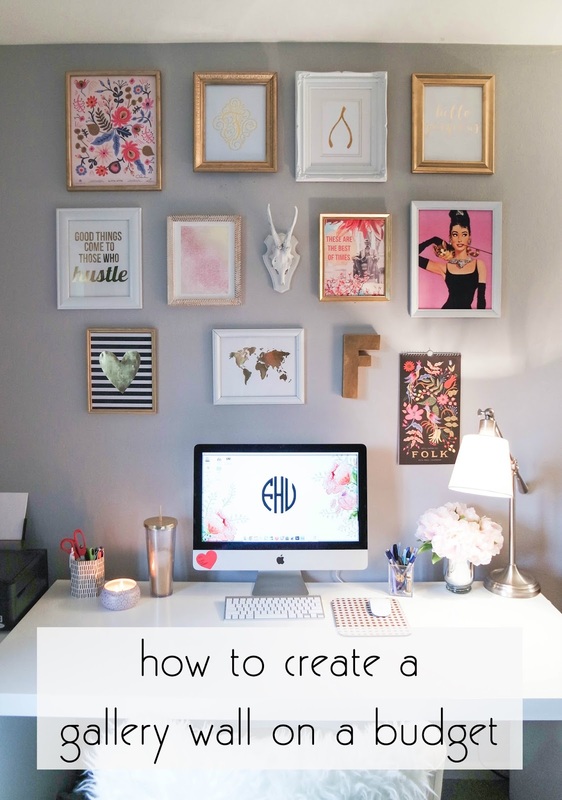 Looking for a way to make a collage? I use iPiccy for every collage I make - it's super easy to use. P.S. Kimmie said she was going to ban me from the internet if I didn't post this picture. I was trying to spring forward. It is truly embarrassing and awful but also hilarious. Hilariously awful. P.P.S. 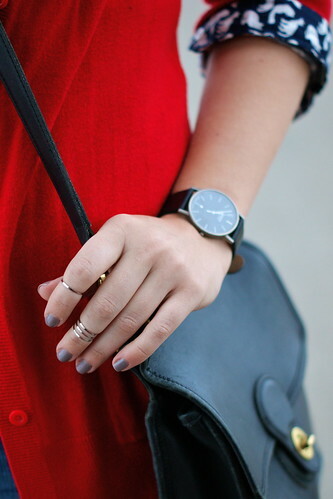 One day left to enter the above the knuckle ring giveaway! I'm so happy to have Chioma here this week for Behind the Blog. I'm always excited to see what Chioma is going to wear next - her outfits are always so cheerful and bright, yet put together. She's definitely a style inspiration for me. In an effort to make smarter purchases, I have taken it upon myself to do a bit more research on the pieces that I would like to add to my closet instead of settling for the first one I find. I hope that by taking my time in choosing these items that I'll spend my money on something that is exactly what I want. I don't want to have any regrets about the purchase a week/month/year down the road and then go out and buy a similar item to make up for the original not being what I wanted in the first place. Spending smarter, not more! So with that in mind, I started on a "mission" to find the perfect chambray popover. I talked a bit about looking for different versions here, but I actually ordered or tried them on in store to find the right one for me. I ordered the Old Navy popover version in three sizes during a 30% off promotion a few weeks ago, making the end cost $12.50. My full button-down Chambray from Old Navy is a Medium Tall so I assumed that the yoke version would fit similarly. As you can see above, it does not. The fabric is waaaaaaayyy too tight in the arms, a problem I do run in to quite a bit. The Large Tall fit my arms well, but had a lot of extra fabric at the bottom, which would have made it difficult to tuck in and/or layer with other shirts as I plan to do with this shirt. Out of the three sizes, the regular Large fit me the best. The arms weren't too tight and there wasn't too much extra fabric towards the bottom. For me, the biggest downside of this shirt is that it does not button up all the way. There are only 3 buttons, so it would be difficult for me to layer it how I would want to. In the end, I know that I would want a shirt that allowed me to layer it multiple ways so even though the price was amazing, I knew I had to make the smarter decision and keep looking (and trust, for $12, that was really difficult for me). Beth sent me an email telling me she had seen a chambray popover at NY&Co. and that it was worth checking out. I generally don't shop there as nothing ever seems to fit me right, but I was hopefully. I ended up making about 5 laps around the store until I found the shirt - but it was only left in a medium so it must have been a very popular piece! Unfortunately for me, it did not fit properly on me. Again it was too tight in the arms, and also somewhat short on me (as most pieces there are). I liked the color of the shirt, and it buttoned all the way up which is was a plus. For me, the wrong fit was obviously a deal breaker, but I think I would have probably passed on this as well as I think the front flap pockets would make it difficult to layer. The J.Crew chambray picture is actually what sparked this desire for a chambray popover, which is why I was so excited initially when I saw the Old Navy version. I'm glad I went in and tried this shirt on instead of ordering it blindly (for close to $80! that's so much!). Again the medium is too tight in the arms, but the large fit well. Besides the outrageous price for a shirt (hi, literally half of my month's budget), I wasn't IN LOVE with it. The color is just a bit lighter than I would want - it's a really really faded blue which I think may make it harder to wear with certain other colors. In the end, I knew I couldn't spend that much money on a shirt that I wasn't 100% sure I was going to enjoy wearing. As I mentioned, I ordered the J.Crew Factory version during their recent 30% off everything promotion, so with shipping this shirt cost me $40 (there wasn't anything else I wanted to spend money on, and the nearest outlet is an hour away so I made an exception to my no paying for shipping rule). I ordered it in a Large as that is what my polka dot popover is. I AM SO HAPPY WITH THIS SHIRT. It is exactly what I was looking for. It fits me well in the arms, it is long enough to so it isn't boxy on me, it buttons all the way up, and the color is something that is more true to what I wanted. The only small downside I can find is that the pockets on the front are two different sizes but that doesn't bother me as I think they somewhat blend into the shirt. I felt the most comfortable in this shirt and I really can not wait to wear it. I'm so happy I didn't decide to overspend on a shirt, or settle for the cheap alternative. This smart spending thing takes a bit more time but I think, for me, it'll be worth it in the end. I'm not really a cat person. Not because I don't want to be, but because I'm really allergic to them. Rings: Galisfly - win a set here! *I really like the Coach Legacy collection for its classic style and rich leather but a ~$300 bag is not something I need/can afford right now. Of all the types of handbags, the crossbodies are my favorite so I wanted to add a neutral leather version to my more inexpensive collection. Jean from Extra Petite recently posted about the vintage Coach market - many of the current Legacy collection bags are based off the originals. Getting a current Legacy style but as an original is something I hadn't thought of. I started searching and bidding on eBay - I wasn't willing to spend more than $50 though so I lost out on quite a few. I received a tip to also search Etsy and that's where I found this bag. She's in great condition - she just needs a little bit of TLC and then she'll be good as new. I'm really happy with this purchase!